In residential districts, there shall be no more than one (1) principal building per lot. One (1) auxiliary dwelling unit may be permitted per lot in the RT-1, RT-2, RT-3 and RT-4 Districts in accordance with Section 17.20.020.C. In the BL, BC, BR, CBD-1, CBD-2, M-1, M-2, O-R and PL districts, more than one (1) building may be erected on a single lot, provided that all Bulk requirements hereof shall be met for each building as though each building were a principal building on an individual lot. Wherever two (2) or more permitted or special uses, each requiring a minimum lot area, are located in the same building or on the same lot, the total required minimum lot area shall be the sum of the areas required for each use individually. Where one or more of the uses does not have a required minimum lot area, the total minimum lot area shall be the sum of the lot coverage of the buildings occupied by the uses for which no minimum lot area is required, and the minimum lot area(s) required for the other uses. All residential lots shall have frontage on a public or private street. Access may be provided from an alley where available, but an alley shall not serve as the frontage of a lot. No lot shall be reduced, divided or subdivided so that a yard or setback becomes less than required by this Title. If the yard or setback is already less than required by this Title, it shall not be reduced further. The minimum yard required for a building or structure shall not be considered a yard space for any other building or structure. Control over Bulk Except as provided in Section 17.08.050 (Nonconforming lots of record) all buildings and structures erected after the effective date of this Title shall meet the requirements for the zoning district or PUD in which they are located, and existing buildings and structures shall be enlarged, altered, reconstructed or relocated only in conformance with the requirements of the zoning district or PUD in which they are located. Within the CBD-1 District, a Sight Triangle is not required except where required by the Director of Public Works as provided in paragraph (5) hereof. Directional signs are permitted within the Sight Triangle. Fences with an opacity of less than fifty percent (50%) not exceeding 3 feet (36 inches) in height are permitted within the Sight Triangle. 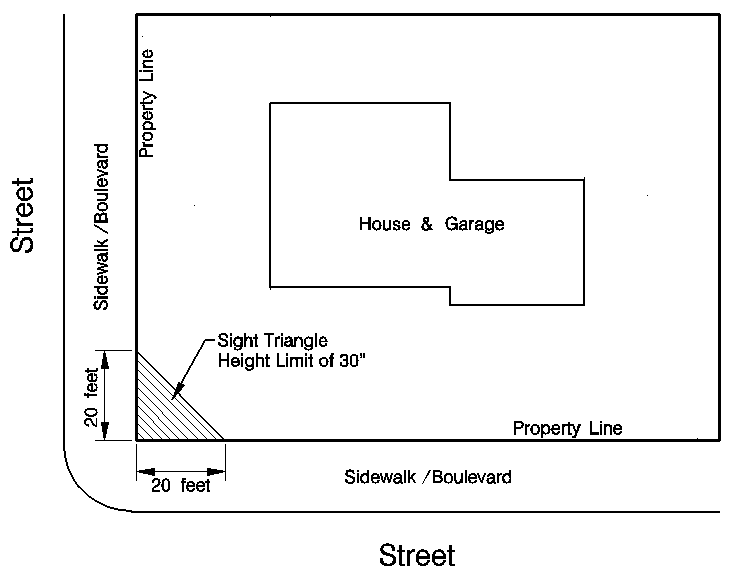 The area of the Sight Triangle may be reduced and/or the allowable height of obstructions increased by the Director of Public Works if he determines that there would not be an undue risk to public safety because of traffic control devices, street design or alignment, or the relative grade of the property and the adjoining streets, alleys, or railroad rights of way. The area of the Sight Triangle may be increased and/or the allowable height of obstructions reduced by the Director of Public Works if he determines that there would be an undue risk to public safety because of traffic control devices, street design or alignment, or the relative grade of the property and the adjoining streets, alleys, or railroad rights of way. A flag lot shall have a lot frontage of not less than fifteen (15) feet, and that part of the lot connecting its buildable portion with its lot frontage (the “flagpole”) shall be not less than fifteen (15) feet in width at any point. 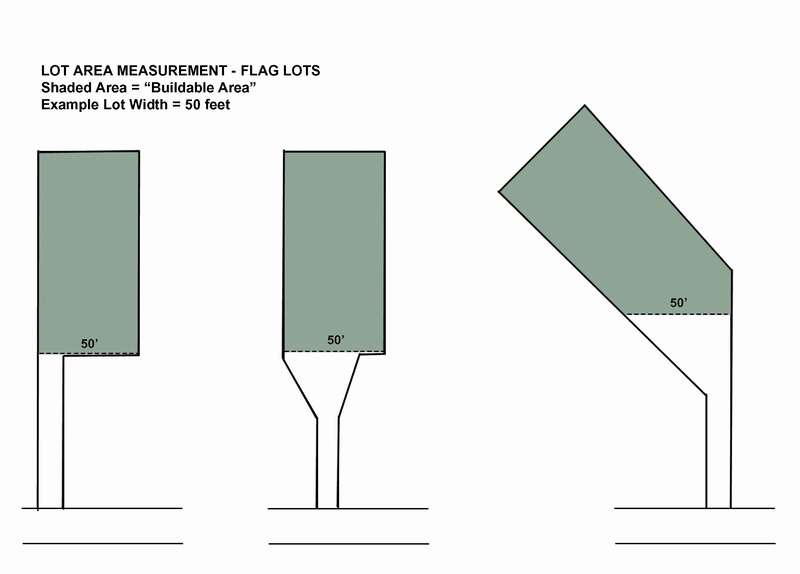 However, if two (2) flag lots share a common access onto a public right-of-way, the minimum lot frontage and the minimum width of the flagpole of the two (2) lots combined may be reduced to not less than eighteen (18) feet at any point. No more than two (2) flag lots may have a shared access to a public right-of-way, and no more than two (2) “flagpoles” of flag lots may abut each other. In the case of a shared access, a maintenance agreement shall be required between the parties to ensure proper maintenance of the access drive. The length of the flagpole of a flag lot, as measured from the lot frontage to the beginning of the buildable area, as defined herein, shall not exceed 200 feet. Flag lots shall comply with all regulations of Chapter 15.28 (Fire Prevention Code) regarding driveway width, hydrant locations and turnarounds. All accessory buildings, structures, and uses shall be located on the same lot as the principal use, with the exception of off-street parking facilities, which may be located on another lot as provided for in Chapter 17.24, Location of Off-Street Parking. The combined lot coverage of all detached accessory buildings and structures located within a required rear yard shall not occupy more than thirty percent (30%) of the required rear yard. For lots within an RT district, if a detached garage is provided in lieu of an attached garage, all structures in the rear yard may occupy up to 40% of the required rear yard. No accessory building shall be constructed prior to construction of the principal building to which it is accessory. No accessory building in the RE, RS, and RT districts shall exceed 20 feet in height. No accessory building shall be located in whole or in part on or over an easement for utilities, drainage, access, or related purposes. Detached accessory buildings and structures shall be located a minimum of ten (10) feet from any principal building on the lot. Accessory buildings and structures attached to the principal building shall comply with all yard and other requirements applicable to the principal building. Private garages for one and two family dwellings shall conform to the applicable yard and setback requirements of the District as modified by Table 17.22-3, but in no event shall a garage for a one or two family dwelling be located closer to any street right of way than 15 feet. If a one or two family dwelling lot abuts a paved public alley, any detached or attached private garage shall be constructed so that access is from the public alley. The maximum width of any garage door opening for a one or two family dwelling shall be twenty-two (22) feet. Detached private garages for one and two family dwellings shall not be set back a shorter distance to the front lot line than the principal dwelling. In the RT1, RT2, RT3, RT4, and CBD-2 Districts, when an attached garage faces a street, the width of the garage door shall not exceed fifty percent (50%) of the width of the dwelling, including the garage door, as measured along the front building line or exterior side building line that it faces. For corner lots, this restriction shall only apply along the lot line facing the primary front door entry into the building, as determined by the Building Commissioner. In the RT1, RT2, RT3, RT4, and CBD-2 Districts, attached private garages for one and two family dwellings with an overhead door facing a street. shall be set back from the front lot line or exterior side lot line that it faces at least five (5) feet more than, a) the remainder of the dwelling walls, or b) the front of an unenclosed porch that extends along at least 75% of the length of the remainder of the dwelling walls adjacent to the garage door. For corner lots, this requirement shall apply to at least one of the building lines facing the street and shall apply to the other building line only when the width of an overhead door or doors facing a street is less than sixty-six (66) percent of the width of the dwelling including the garage, as measured along the front or exterior building line that it faces. a. A fence or wall, including all posts, bases and other structural parts shall be located completely within the boundaries of the lot on which it is located. No fence shall be located closer than twelve (12) inches from a public sidewalk. b. All fences shall be erected so that the finished side of the fence faces outward, or away, from the lot on which the fence is erected, except that where a fence on a residential lot is within five feet of property containing a nonresidential use or that is zoned for a nonresidential use, any part of the fence that satisfies this condition may be erected so that the finished side faces inward on the residential lot. c. All metal fences shall be at least nine (9) gauge wire or a minimum of .148 inch diameter wire. d. In residential districts, chain link and woven wire fences are prohibited in front yards and exterior side yards. If located in a rear yard in a residential district, chain link and woven wire fences are prohibited within twenty (20) feet of any right of way line. e. Barbed wire, razor wire and fences of similar material are permitted only in the BC, BR, M1, M2 and PL Districts. All fences shall be maintained in good condition at all times by the owner and/or occupant of the property. If a fence is found to be in a deteriorated condition and/or in need of repair, the Building Commissioner may order the fence to be repaired, replaced or removed depending upon the condition of the fence. Such order shall be in writing. All fences shall comply with the height requirements listed in Table 17.22-1 (Maximum Allowable Fence Height), except as provided in Table 17.22-2 (Fence Height Exceptions). All Fences are subject to the sight triangle requirements of Section 17.22.010 (G). Fences within 40 feet of the right of way of major arterials. Fences in Exterior Side Yards and in the Rear Yard of Through Lots that are adjacent to a Front Yard on an adjoining lot: Where the fence is set back from the right of way line a minimum of 5 feet and the area between the fence and the right of way line is landscaped with at minimum one shrub for every 5 feet of fence length. The landscaping design may be flexible in its arrangement by grouping plant materials and providing open areas around gates or other fence openings. Fences shall not be installed less than ten (10) feet from any stormwater inlet or outlet opening; however, the City Engineer may require a greater distance in keeping with generally accepted engineering practice. Fences shall not be permitted in utility easements where such fence would interfere with the operations of a utility. Applications for a permit for a fence to be installed in or across a utility easement shall be subject to an affidavit and release by the property owner, in a form acceptable to the City, stating that he/she has read the requirements for fences located in easements and that he/she agrees to comply with them, and that he/she does for himself/herself, heirs, successors and assigns indemnify and hold harmless the City from any liability asserted by others in connection with the placement of the fence and that he/she permits the removal of any fence or any other structure or form of landscaping within the utility easement area by the City if the fence or landscaping obstructs the City utility or access thereto. The affidavit shall be recorded at the property owner’s expense by the City in the Office of the County Recorder of Deeds. Mechanical Equipment See Section 17.26.120 for screening requirements applicable to exterior HVAC units, compressors, pumps, and similar mechanical equipment. Roof-mounted equipment shall be located at least six (6) feet from any supporting wall of the building, so as to permit safe access to the roof by the Fire Department. Communication Antennas shall be concealed through location on a roof or site so as to limit their visibility from public streets and adjoining property, to the extent possible without impairing the antenna’s ability to receive a signal. Communication Antennas shall be permanently installed on a building, in the ground or on a foundation, not on a portable or movable structure. Communication Antennas, except for non-commercial wireless antennas (amateur radio), shall not extend more than twenty (20) feet above the height of the principal building on the lot. Cables and lines serving ground-mounted Communication Antennas shall be located underground. All exposed surfaces and supports of Communication Antennas shall be kept clean and painted. The Building Commissioner may require repair or removal of antennas that are damaged, deteriorated or no longer in use. No additional signs or advertising are allowed on Communication Antennas except for logos affixed by service providers or antenna manufacturers. Small Satellite Dish Antennas as defined in this Title shall comply with the General Requirements for Communication Antennas. Large Satellite Dish Antennas shall be screened in accordance with Section 17.26.120, Screening of Large Satellite Dish Antennas. There shall be not more than one (1) Large Satellite Dish Antenna per single-family, two-family, or townhouse dwelling unit. For all other uses, there shall not be more than one (1) Large Satellite Dish Antenna per building on a lot. Large Satellite Dish Antennas shall not be mounted on a building containing singlefamily, two-family, or townhouse dwelling units. Large Satellite Dish Antennas shall not exceed a dish diameter of twelve (12) feet or an overall height of twelve (12) feet. Communication Antennas that are Small Wireless Facilities, as defined in Chapter 13. 24 Small Cell Wireless Facilities" shall, in addition, comply with the regulations set forth in Chapter 13. 24. All setbacks shall be measured from the base of the tower to the property line or street right-ofway. If a tower is to be placed on a leased portion of a larger lot owned by someone other than the tower owner, setbacks shall be measured from the boundaries of such larger lot. In residential districts, Communication Towers shall be set back from all property lines by a minimum distance of one hundred percent (100%) of the height of the tower, plus ten (10) feet. In non-residential districts, Communications Towers must meet the setback requirements for the underlying zoning district, and shall be set back from any residential district a minimum distance of five hundred (500) feet. permitted in any Right-of-Way in conformance with the requirements of Chapter 13. 24, without regard to setbacks from private property lines. Height shall be measured from grade level at the tower base to the highest point on the tower. In residential districts, the maximum height shall be one hundred (100) feet. In non-residential districts, the maximum height shall be one hundred fifty (150) feet. The height of Communication Towers that are Wireless Support Structures on which Small Wireless Facilities are collocated is limited by Chapter 13. 24 " Small Cell Wireless Facilities", Section 13. 24. 008 " Height Limitations. WET-SMs shall only be permitted as accessory to an existing principal building or use. WET-SMs shall be mounted onto existing principal or accessory structures. Any sound generated by the WET-SM shall not be audible at the property line. WET-SMs shall not exceed a height of fifteen (15) feet above the highest point of the structure it is mounted upon. WET-TMs shall only be located on lots that are one (1) acre in area or greater. There shall be no more than three (3) WET-TMs per lot. Only free-standing monopole towers without guy wires shall be permitted. Towers shall be set back from all property lines by a minimum distance of one hundred percent (100%) of the height of the tower, plus ten (10) feet, and shall be set back from any residential district a minimum distance of five hundred (500) feet. All setbacks shall be measured from the base of the tower to the property line or street right-of-way. The total height of the WET-TM shall not exceed 120 feet. Tower height shall be measured as the vertical distance from the ground level of the base of a WET-TM to the uppermost vertical extension of a rotor blade, or the maximum height reached by any part of a WET-TM. WET-TMs shall not be artificially illuminated unless required by the FAA. All exposed surfaces and supports of the WET-TM shall be kept clean and painted. The Building Commissioner may require repair or removal of towers that are damaged, deteriorated or no longer in use. Sound generated by the WET-TM shall not be audible at the property line. Boxes shall only be permitted on properties defined as Shopping Centers in Section 17.30.0302. Boxes shall not be permitted on properties in which the Shopping Center buildings are 100% vacant. Written permission of the property owner must be obtained before placing the box on any property. There shall be no more than three (3) boxes located in a Shopping Center. Boxes shall not be located in the front or exterior side yard parking or building setback. Boxes shall not be located within the required Sight Triangle in accordance with Section 17.22.010.F. Boxes shall not be located within any off-street parking space. Boxes shall not be placed as to obstruct pedestrian or vehicular traffic. Boxes shall be located on a hard permanent surface. Boxes shall be located so that they are inconspicuous from the public right-of-way, as determined by the Director of Community Development. Boxes shall be limited to a maximum height of 7 feet. Individual boxes shall be limited to a maximum foot print area of 25 square feet. Signage lettering on the box cannot exceed 5 inches in height. The name, address, email, and phone number of the box operator shall be posted on the box. Pick up times for removal of the donated contents shall be posted and be visible on the front of the box. Encroachments into required yards shall be permitted as provided in Table 17.22-3 (Permitted Encroachments), subject to the specific limitations applicable to the particular encroachment described. Canopies accessory to gas stations, drive-through restaurants, drive-through banks, etc. 1 Where it is impractical to locate mechanical equipment within the interior side or rear yard of a single family or two family dwelling, the Building Commissioner may approve an alternative location in the yards indicated, provided the mechanical equipment is screened from view from adjoining property and public streets in accordance with Section 17.26.120. 1 Where a Small Satellite Dish Antenna cannot receive a clear signal within the yard and setback requirements of the zoning district or the rear yard, the dish may be located in an alternative location in the yards indicated in compliance with Section 17.22.020 Communication Antennas. The provisions of this Section are applicable to all exterior lighting in the City of St. Charles installed after the effective date of this Section, except for lighting installed and maintained within a public right-of-way, lighting used in conjunction with public safety operations, and hazard or warning lights required by a governmental agency. No exterior lighting shall be installed or modified so as to violate the provisions of this Section. For all property other than one and two family dwellings and townhomes, all exterior lighting shall be designed, shielded and directed so that direct light from the lamp (point light source) is not directly visible from residential properties or public rights-of-way within a distance of 500 feet or less. This can be accomplished using luminaries which a) by their design, direct the light downward; b) have opaque shielding installed that prevents direct illumination from reaching adjacent properties or public rights of way; or c) utilize a translucent material to diffuse the light. This provision shall not apply to lighting for outdoor uses of a governmental entity such as a Park District or School District, provided all other requirements of this section are met. For one and two family dwellings and townhomes, all exterior lighting sources shall be either: a) limited to 900 lumens in the case of flood or spot luminaires and 1800 lumens for all other luminaires, or b) designed, shielded and directed as required for uses other than one and two family dwellings and townhomes. No exterior lighting shall be maintained on a lot so as to shine into, or upon, any other lot or any right of way with an intensity great enough to reduce a viewer’s ability to see, or to cause momentary blindness. Exterior lighting used in a manner that could interfere with the safe movement of motor vehicles on public streets and alleys. Any light that could be confused with, or construed as, a traffic control device, unless authorized by State, Federal, City or County government. The uniformity ratio of exterior lighting on a lot, as defined by the Illuminating Engineering Society of North America (IESNA), for all property other than one and two family dwellings and townhomes, shall be 4:1. High pressure sodium and fluorescent lamps are prohibited because their color is significantly different from the daylight spectrum. Uplighting and architectural lighting is permitted to light a building façade, walkway, driveway, landscaping, sign or primary entrance, provided that all direct illumination from uplighting shall be directed onto the building wall, walkway, driveway, landscaping, sign or entrance it is intended to illuminate, and the light intensity at the property line does not exceed the light trespass standards specified in the preceding paragraph C. Illumination to highlight architectural features may include lines of low-intensity unshielded incandescent bulbs of a single color, or neon tube type lighting, but only where such lighting is consistent with and will enhance the architectural character of the building and does not constitute part of a sign, trademark, or other advertising display. Luminaires mounted on buildings that are designed to illuminate parking lots, driveways, loading areas, and similar areas and that are not encompassed within the description of “uplighting and architectural lighting” in the preceding paragraph, shall be a non-adjustable full cut-off design and shall be directed downward at an angle of no greater than 45 degrees from the vertical plane, and shall not project above the height of the building. Luminaires exceeding 2000 lumens mounted on one and two family dwellings and townhomes shall be a non-adjustable full cut-off design and shall be directed downward at an angle of no greater than 45 degrees, and shall not project above the height of the building. Luminaires mounted on gas station, drive-through and other outdoor canopies over vehicular use areas shall be a full cut-off design and shall be directed downward at an angle of no greater than 45 degrees from the vertical plane, or shall be completely recessed into the canopy with flat lenses, or shall be shielded by other means, to block direct view of the light sources as viewed from the property line at a height of three and one half feet (3 ½’) above grade. The maximum height of light poles, as measured from finished grade at the base to the bottom of the luminaire, shall not exceed the maximum building height in the zoning district in which they are located. Lighting for an Outdoor Recreation use owned and operated by a governmental entity such as a Park District or School District shall be exempt from this height limitation, provided all other requirements of this section are met. Sign illumination is governed by Chapter 17.28 (Signs). Blinking, flashing, moving, revolving, flickering, changing intensity and changing color lights shall be prohibited, except for temporary holiday displays, lighting for public safety or traffic control, or lighting required by the FAA or other governmental agency for air traffic control and warning purposes. Nonconforming historic lighting fixtures which are consistent with the character of a historic structure located within a Historic District or on a designated Landmark may be exempted from the regulations of this Section 17.22.040, provided that the Historic Preservation Commission has made a finding that the fixtures are an important architectural or historic element, the removal of which would be detrimental to the historic or architectural character of the building or site. Exemptions for Private Street Lighting Lighting for private streets that is reviewed and approved as part of a Subdivision or PUD plan shall be exempt from the requirements of this Section. All uses shall comply with the performance standards established in this Section unless any Federal, State, County or local law, ordinance or regulation establishes a more restrictive standard, in which case, the more restrictive standard shall apply. No activity or use shall be conducted in a manner that generates a level of sound as measured on another lot greater than that allowed by Noise Regulations of the State Pollution Control Board, as amended from time to time. The limits shall not apply to construction noises, noises emanating from safety signals or warning devices, noises not directly under the control of the owner or occupant of the property, and transient noises from moving sources, such as motor vehicles, railroads and aircraft. Any activity or operation of any use producing glare or heat shall be conducted so that no glare or heat from the activity or operation shall be detectable at any point off the lot on which the use is located. Flickering or intense sources of light shall be controlled or shielded so as not to cause a nuisance across lot lines. No earthborne vibration from the operation of any use shall be detectable at any point off the lot on which the use is located. Dust and other types of air pollution, borne by the wind from sources, such as storage areas, yards, roads, conveying equipment and the like, within lot boundaries, shall be kept to a minimum by appropriate landscaping, screening, sheltering, paving, fencing, wetting, collecting or other acceptable means. No persons shall cause, or allow, the emission of fugitive particulate matter across lot lines visible to an observer looking generally toward the zenith, beyond the property line. This requirement shall not apply when the wind speed is greater than twenty-five (25) miles per hour. Determination of wind speed for the purposes of this rule shall be by a one (1) hour average or hourly-recorded value at the nearest official station of the U.S. Weather Bureau or by wind speed instruments operated on the site.